Deus Ex Go follows in the step-by-step footsteps of Square Enix’s other mobile puzzle titles, Hitman Go and Lara Croft Go. Like those games, you move from node to node to complete single-level puzzles that grow steadily more challenging. Deus Ex Go, however, takes the stellar formula of these games and adds new complications. Deus Ex Go retains the simplicity of the previous Go games, but the puzzles, plot, and mechanics are meatier. The levels are short but plentiful, and the difficulty ramps up quickly. I found the game less straightforward, both in terms of your movement and the brainpower required to solve some of its trickier puzzles. You’ll backtrack more than you did in Hitman Go, for instance, and there’s more variety of enemy types. With distinctive animations and radical color changes when they spot you, the enemies feel intimidating, even if they’re just predictable moving pieces on a board. The puzzles feel more complex (your mileage may vary: I am not the best at puzzle games, especially when playing them on a crowded commute before I’ve had my coffee). I found myself relying on hints more than I did in other Go games, and I’ll admit to even purchasing more and then immediately regretting it when a key move I hadn’t thought of instantly became clear. I found myself peering at my phone in the dark well after bedtime trying to complete just one more level, relying more on planning and creative thinking than the trial and error I relied on in Hitman Go. I was occasionally stumped by not being able to tell exactly how an enemy would behave or where it was facing, but those moments were few. The game also features a live challenge mode, a series of new puzzles every weekday. Completing them rewards you with Praxis Kits you can unlock to upgrade Adam Jensen in the PC and Xbox One versions of Mankind Divided. It’s an interesting addition to the game, and something to do once players have exhausted the 50+ bite-sized levels of the story mode. I didn’t spend too much time with this week’s puzzles, featuring rotating panels and giant walker robots, but they seemed like more intimidating takes on puzzles in the story mode. You can also unlock Praxis Kits by completing challenges, such as attaining “mastermind level” by beating each level within a set number of moves. I didn’t find mastermind level too difficult to attain when I set my sights to it, but its emphasis on frugality sometimes felt slightly at odds with the core complexity of the game proper. Nevertheless, the challenge added replay values to the levels I’d already completed. 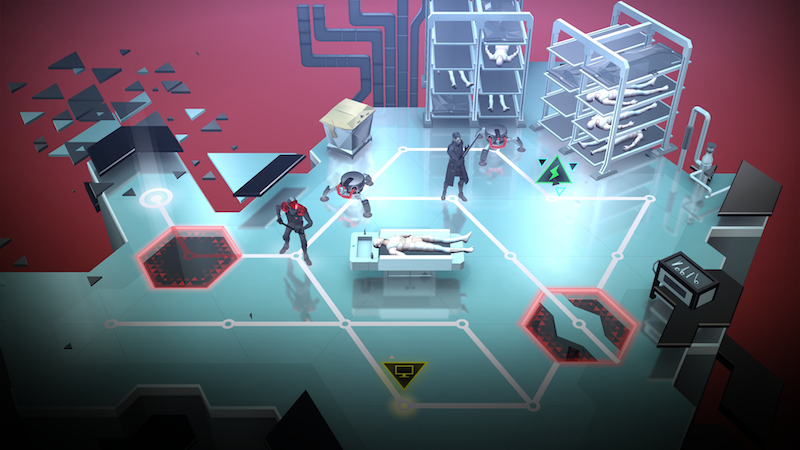 Like its predecessors, Deus Ex Go grabs key elements from its parent game and distills and remixes them into something unique. Hacking felt like the hacking in Deus Ex: Human Revolution, and the cloaking, with its excellent, chunky animation, was as satisfying as it is in the main game. Deus Ex Go felt like a pocket version of Deus Ex, maintaining the core of one of my favorite series in a new, smaller guise.